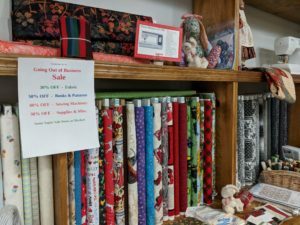 After 25 years in Cissna Park Illinois, Prairieland Quilts will close its doors on Saturday, July 14, 2018. Opening on October 1st of 1993, Prairieland Quilts was a premier quilt shop in East Central Illinois. With 1000’s of bolts of fabric and hundreds of book and pattern titles, the quilt shop drew traffic from all over the Midwest. Owner Suzanne Bruns said “We have been a Janome sewing machine dealer since our second year in business”. Her husband John has been the sewing machine service technician all these years. “We plan on continuing to sell and service Janome Sewing machines in a shop at our rural residence” Suzanne added. As to why they have decided to close the business, “the quilting industry is not as robust as it once was” Suzanne said. “The internet has changed the face of our industry and our customer base is aging, It seems as though the younger generation just aren’t adopting quilting as a craft they want to do”. During the next 3 months, Prairieland will be offering different sales to reduce their inventory. Staring with a 30% off all fabric and 40% off all sewing machines for the month of April. Additional progressive discounts will be announced in the future on our website.